(U) Some criminal bombers exploited their victims’ sense of greed or general curiosity by hiding improvised explosive devices (IEDs) inside common everyday items and leaving them as discarded merchandise to be found by the victim. Victims then perceived these situations as an unexpected opportunity to obtain an object of value with no associated cost. The devices utilized victim-operated switches rather than command or time switches. While a seemingly discarded working tool or item could be considered an enticement in itself, the lack of a written note or similar enticement distinguished these bombing incidents from other IEDs that utilized written messages to bait the victim. Recent bombing incidents in Phoenix and Glendale, Arizona, might be another example of this tactic. 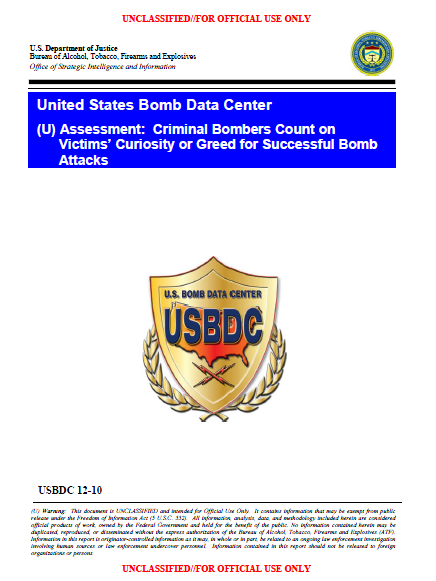 (U) The United States Bomb Data Center (USBDC) prepared the following assessment to provide information and analysis regarding criminal bombers using victim-operated IEDs (VOIEDs) hidden in seemingly discarded tools and other items to target victims with an inclination to take these items for their own. This assessment highlights three bombing investigations where criminal bombers utilized this tactic with multiple devices. In order to protect the ongoing investigation into the three bombings in Phoenix and Glendale, Arizona, no specific details about these IEDs will be provided other than those already published by other agencies. A query of the Bomb Arson Tracking System (BATS) database identified appropriate cases that utilized these types of devices. Further information on these investigations originated from ATF investigation reports and laboratory reports. All of the incidents originated from the United States, but the assessment could apply to similar cases in other countries. • (U) Criminal bombers exploited their victims’ propensity for greed and general curiosity by concealing IEDs inside common everyday items and leaving them where they could be easily found. • (U) The IEDs in these cases utilized victim-operated switches to function the devices. • (U) Each of the highlighted bombings lacked a written note as a means of enticement, possibly because the bombers knew that the victims would take the item based on its perceived intrinsic value without any need to further manipulate the victim with a written enticement. • The target selection for these bombings was a mixture of random victims or an attack against a victim due to a personal vendetta. (U) Some criminal bombers exploited their victims’ sense of greed or general curiosity by hiding improvised explosive devices (IEDs) inside common everyday items and leaving them as discarded merchandise to be found by the victim. Examples of these tools included electric razors, electric drills, flashlights, and a toolbox. The victims found these items and took them under the belief that the tools were merely discarded but still useable. The bombers used victim-operated switches to function the devices rather than a command switch or a time switch. Using a victim-operated switch avoided premature explosions or having the device initiate when the victim was not in close proximity to the device. Moreover, the bombers in these cases did not use a written enticement to lure the victim into handling the item. Without the enticement, these bombing incidents were differentiated from other bombing incidents with victim-operated switches that used an enticement such as a note, gift wrapping, letter or package or some other method to compel the victim to handle the item and function the IED.